. : Canadian Ski Marathon and Running a Spring Marathon - The Perfect Training Partnership :: Ski XCOttawa.ca :: Skiing in Ottawa and Gatineau Park :. As the snow falls and the wind howls one begins to think about the training program for a spring marathon or half marathon and how to incorporate the winter conditions. I have found over the years the CSM has helped me in my training for the Boston Marathon and Ottawa Marathon allowing me good results. 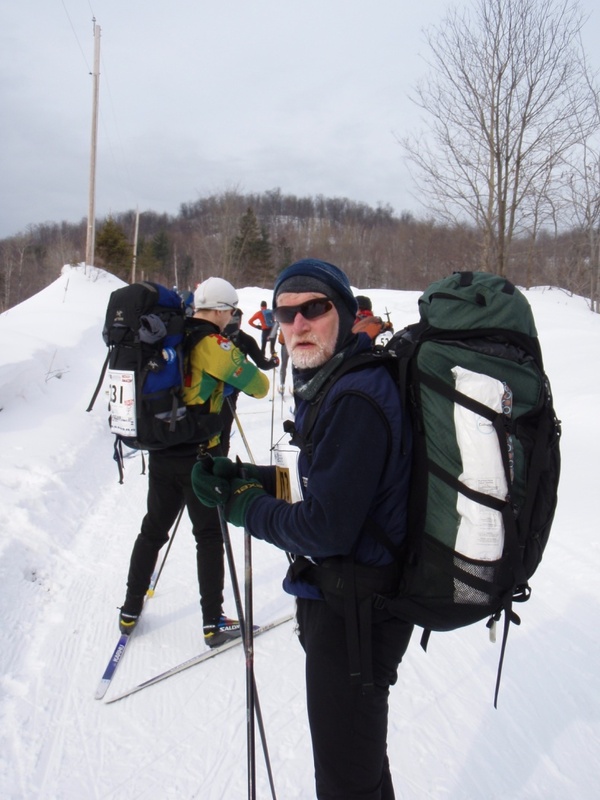 A bit of background; I am a long time (over 25 years) participant in the CSM and have done the Gold Coureur des Bois (ski 160 km and sleep outside overnight) 13 times, so I have a great affinity for this event. 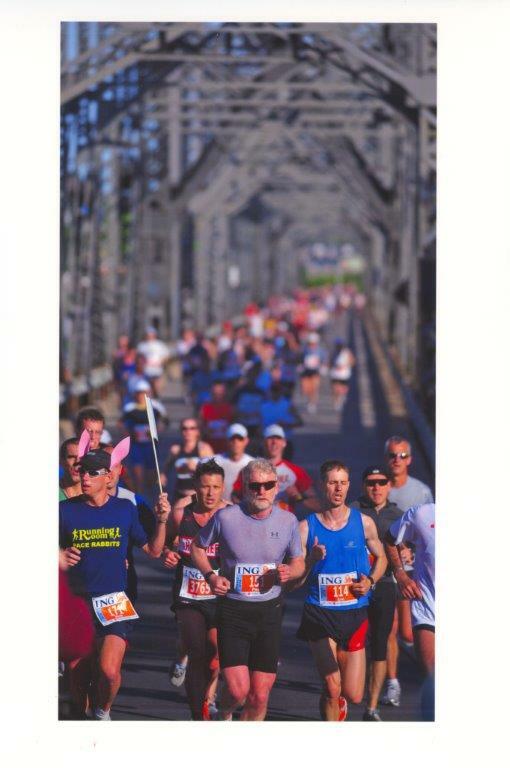 I have also run the Boston Marathon and Ottawa Marathon a number of times, sometimes in the same year. So one might ask why the CSM and how will it help me. It is a good question and here are the reasons that I have found. Other people, more qualified, may have differing opinions. This has worked for me. Once the snow has fallen I start a gradual build-up of distance by doing two weekend skis instead of long runs on the weekends. Usually this is mid-December until two weeks before the event when I do two 60 kilometer ski days and then taper up to the event. The level of exertion is perfect and I find the change from running long distances saves my legs from the wear and tear of pounding on the streets. I carry a large backpack, about 30 pounds (this is a bit heavier than the typical weight of a Gold Coureur des Bois pack which is 20-25lb), and find the extra weight helps to build strength in my core. Once I drop using a pack I feel much lighter in my running stride. For mental preparation I have Gatineau Park as my training ground. With the scenery, friendly skiers and shelter of the trees from wind, the long hours of training are enjoyable and I get prepared mentally for the challenge of the full ski marathon. As well, there is ample time during the week to do my speed work and other runs essential for a successful marathon. Although not a race, in doing the full distance I ski about 10 hours per day at a speed enough to ensure I make the cutoff time. This has taught me about proper pacing in a long event. A 3 to 4 hour running marathon seems short in comparison. The CSM has taught me to overcome adversity, as over the years I have endured injury and physical punishment. Some years I had to drop out, but in other years I pushed through and finished. Sometimes while running a marathon and having the thoughts about “why I am doing this” I think back to the CSM and realize I can get through this. The people I have met skiing, volunteering and cheering make the CSM one of the best events in which I have participated. It makes me look forward to the spring marathons and the larger crowds and in meeting new folks at each event. After the marathon I have two months to Boston and switch over to running on weekends. I’ll change up the training and take the odd Saturday to head over to Gatineau Park to clear my mind and again enjoy the scenery and different terrain from Ottawa. In wrapping up this article I believe the proof is in the results. I have to say I have been blessed to be able to participate in such great events. Since 2007 I have run one or more marathons a year in under 3:10 (with the exception of the 2012 Boston Marathon/Heat). ). I have also managed to break 3 hours at the 2011 Boston Marathon when I was 51, satisfying a long standing personal goal and setting a new benchmark of personal achievement. So if you are willing to give it a try it may help you in achieving your goals. Perhaps you should add it to your bucket list then get addicted and come back each year. It’s been working for me all these years. Author: Paul Foley, hails from Ottawa, Canada. He is a 6 time Boston Marathoner, top 50 age group finisher, and is skiing to accomplish his 14th Gold Coureur des Bois in the 2014 Canadian Ski Marathon. CSM: Calling All Youth: Let’s Ski the CSM Together!